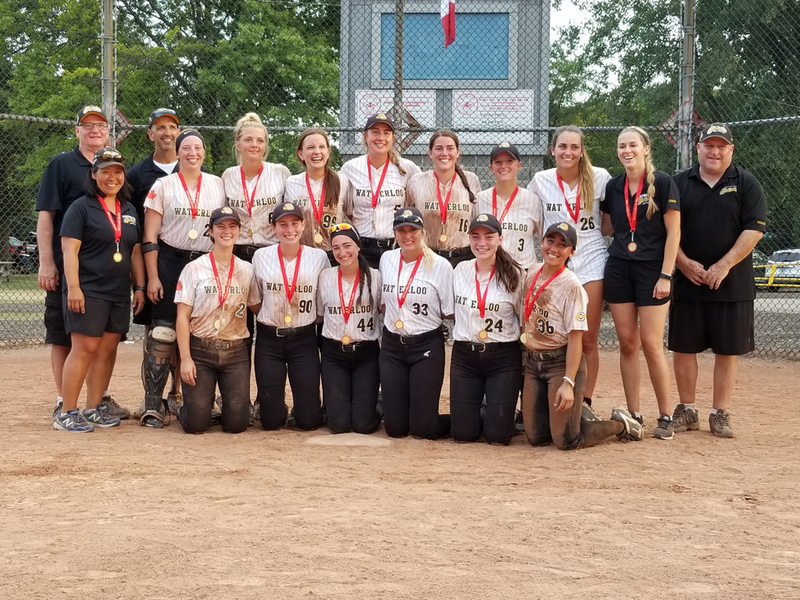 The Waterloo U19 girls put together an amazing run of ball over the weekend winning 9 of 10 games including 4 in a row in the grueling heat of Windsor on Sunday to win the Provincial qualifying tourney and will represent as Ontario 1 in Surrey BC next month at Nationals. The final was a back and forth thriller with the Ghost girls getting 4 runs to go ahead in the 5th and holding off a late Windsor rally to win 8-7. Jade Nowe had a huge game with a 2 run single and later a 3 run homer and started 2 double plays at 3B to kill rallies. Allyse Volpe capped off a great weekend with 4 more hits and scored twice while Avery Hilpert had a pair of hits and the game winning RBI after Nowe’s homer. Shelby Kempel picked up the win in relief of Skyler Stockie who had pitched the first 4. In the semi-finals the locals edged out Oakville 7-6 avenging their only loss on Saturday night. Stockie pitched 3 relief inning to pick up starter Anissa Zacharczuk and got the pitching win. Volpe was an offensive menace again with 4 hits from her leadoff spot while Rainey Psenicka chipped with in with 3. Nowe and Claire Lavereau each had a pair of hits too. Earlier in day the Ghosts downed Brampton 11-7 with a 7 run 4thinning explosion setting the tone. Nowe had 3 more hits including a 2 run homer while Volpe and Lavereau each had 3 as well. Zacharczuk also had 2 safeties while Psenicka had 3 RBI’s. Prior to that the Ghost girls actually qualified for Canadians by assuring a top 4 placing with a mercy shortened 10-0 drubbing of Guelph. Presly Buchanan had the pitching victory with relief help from Kempel who also had a huge 3 run homer in the 1st to spark the offensive onslaught. Jess Panchaud had a single and a double and 3 runs driven in. The Ghost Gold girls will head to Surrey BC to begin play on August 6th to 12th hopefully to improve on their 3rd place finish of 2017 with 12 returning players from that team. 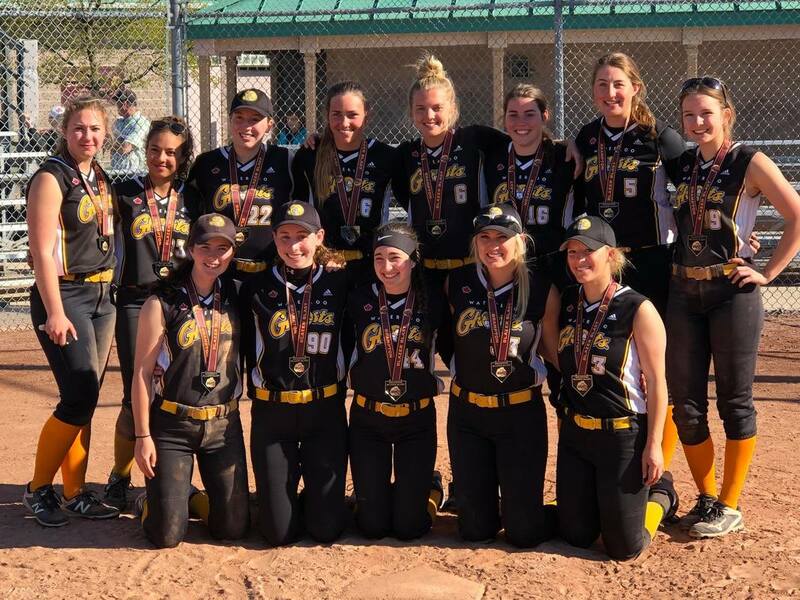 Waterloo Ghosts Gold 18U took home a 5-1 victory over Brampton Murray on Sunday. Waterloo got things started in the second inning when Camrynn Schnarr singled on a 2-2 count, scoring one run. Presly Buchanan was credited with the victory for Waterloo Ghosts Gold 18U. She allowed five hits and one run over four innings, striking out three and walking one. Anissa Zacharczuk and Skyler Stockie entered the game out of the bullpen and helped to close out the game in relief. Waterloo Ghosts Gold 18U totaled 12 hits in the game. Schnarr, Daly, Jade Nowe, and Shelby Kempel each collected multiple hits for hosts. Waterloo Ghosts Gold 18U took the lead late and defeated Oakville 2-1 on Sunday in a tight semi-final game. The game was tied at one with Waterloo Ghosts Gold 18U batting in the bottom of the fifth when Allyse Volpe hit a solo homer to decide the final count. Stockie got the win for Waterloo Ghosts Gold 18U. She allowed six hits and one run over seven innings, striking out five and walking one. Ghosts Gold 18U scattered eight hits in the game. Rainey Psenicka and Mia Valcke each had multiple hits for Waterloo Ghosts Gold 18U. Waterloo Ghosts Gold 18U notched four runs in the third inning. Rainey Psenicka, Claire Lavereau, and Shelby Kempel all moved runners across the plate with RBIs in the inning. Kempel got the win for Waterloo Ghosts Gold 18U. She went three innings, allowing zero runs on one hit, striking out three and walking zero. Skyler Stockie threw two innings in relief out of the bullpen. Waterloo Ghosts Gold 18U tallied 14 hits in the game.. Kempel, Lavereau, Nowe, Daly, and Psenicka all had two hits to lead Waterloo Ghosts Gold 18U. Ghosts Gold 18U was sure-handed in the field and didn't commit a single error. Jessica Panchaud had the most chances in the field with nine. Waterloo Ghosts Gold 18U defeated Toronto 7-0 on Saturday as two pitchers combined to throw a shutout. Waterloo Ghosts Gold 18U secured the victory thanks to five runs in the fifth inning. Waterloo Ghosts Gold 18U offense in the inning was led by Monica Daly, Presly Buchanan, Camrynn Schnarr, and Jade Nowe, all sending runners across the plate with RBIs in the inning. Anissa Zacharczuk was the winning pitcher for Waterloo Ghosts Gold 18U. She allowed two hits and zero runs over four innings, walking one. Shelby Kempel threw one inning in relief out of the bullpen. Waterloo Ghosts Gold 18U collected 13 hits on the day. Volpe, Lavereau, and Nowe each collected two hits to lead Waterloo Ghosts Gold 18U.